Interventional radiology is a medical subspecialty in which radiologists perform Minimally-Invasive procedures utilizing the guidance of radiological techniques (including X-ray Fluoroscopy, CT scan and Ultrasound). The Interventional Radiology division of the Department of Radiology at Royal Care Hospital is equipped with State-of-the-art imaging technology. The Digital Subtraction Angiography (DSA) lab IGS 520 from GE - The heart of any Interventional Radiology unit is the DSA Lab. Apart from the routine Fluoroscopy, Digital subtraction imaging and 2D roadmapping facilities, this advanced lab also is loaded with cutting-edge software features including 3D rotational angiography, 3D road-mapping and Needle tracking softwares. These softwares are essential in performing complex Neurovascular Interventions and challenging percutaneous needle- guided procedures. Ultrasonography - Philips Epiq 5G - Equipped with Needle-guidance and needle enhancement softwares which aid in the performance of percutaneous procedures. 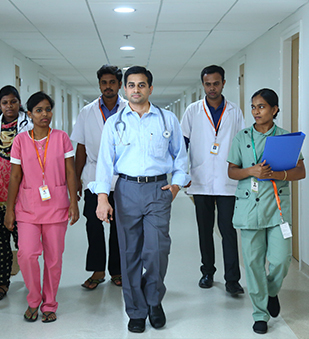 We provide round-the-clock support in the management of Acute vascular emergencies - Like Acute Stroke, Acute limb ischemia, Traumatic vascular injuries, Acute gastrointestinal haemorrhage. We are presenting a few of the Neurovascular procedures that we have performed in the last year. Interventional radiology has now become a mainstay in management of Acute ischemic stroke. In addition to IV thrombolysis in cases presenting in window period (<4.5 hours), endovascular treatment (Thrombectomy) is performed for cases with large vessel occlusion (like ICA, M1-segment of MCA). A 60 year old male patient presented with acute- onset of weakness of left upper and lower limb (Grade 2/5 power) associated with deviation of angle of mouth. Patient presented to Emergency room 2 hours after symptom onset. Non-contrast CT did not show any abnormality. A CT angiogram revealed occlusion of right Middle cerebral artery. Patient was shifted to the DSA lab and a thrombectomy done. The procedure was completed within 1.5 hours of presenting to the hospital. Patient’s power gradually improved over the next few days and at the time of discharge, the limb power was 4+/5. A 57 year old male presented with history of acute-onset headache (Thunderclap headache) of 7 hours duration. CT revealed Subarachnoid haemorrhage involving the CSF cisterns of the posterior fossa. DSA done revealed a wide- necked aneurysm involving the Posterior inferior cerebellar artery (PICA) origin. The patient was taken for aneurysm coiling. As the aneurysm was wide-necked, a balloon was navigated across the neck of the aneurysm via the opposite vertebral artery and basilar artery and coiling of the aneurysm was successfully accomplished. The patient was managed for his SAH and was discharged 2 weeks later with no neurological deficit.